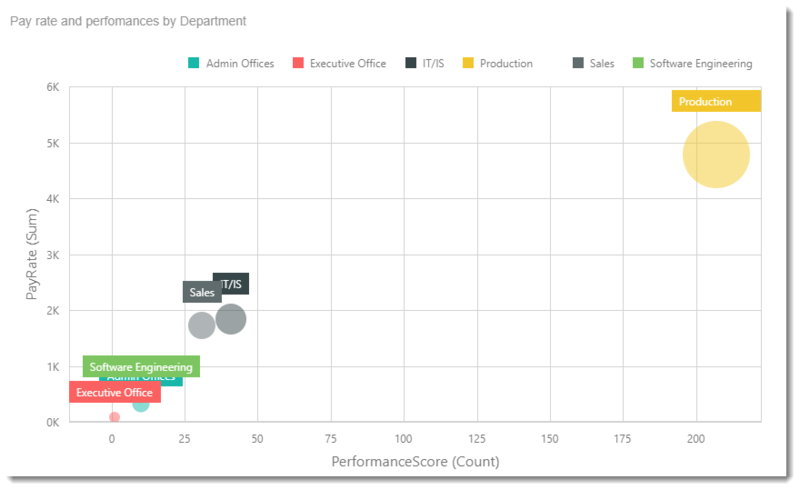 This article will help you to create a Scatter Chart Visual dashboard item to data. 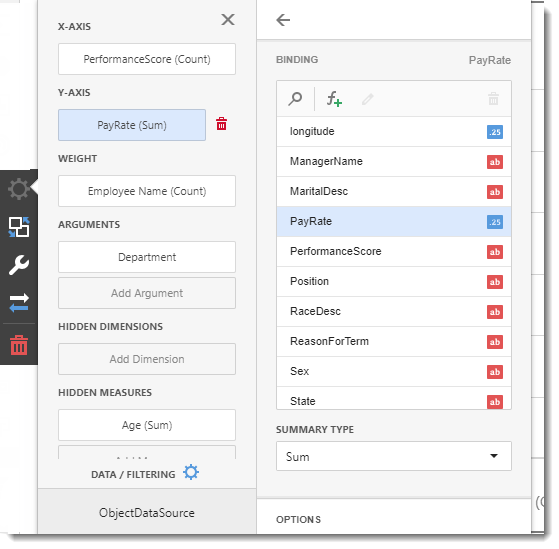 A Scatter Chart is ideal to show the relationship between two variables. 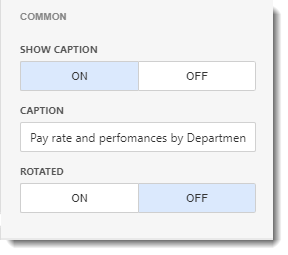 How the performance is affected by the pay rate? 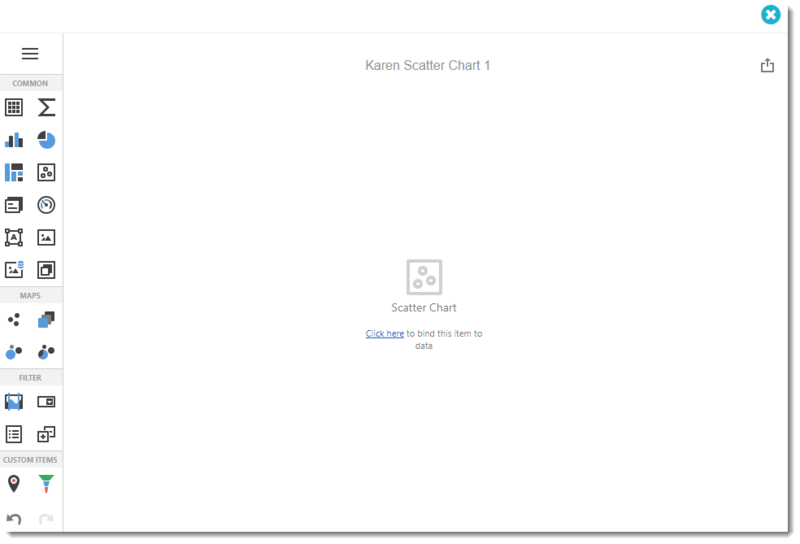 To create this visual, begin by selecting Scatter Chart. 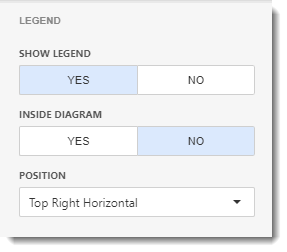 X-Axis section contains the data item against which the X-coordinates of data points are calculated. 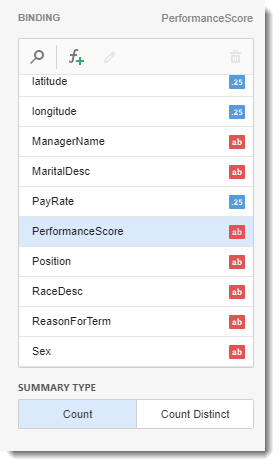 For the example above I am going to show the PerfomanceScore. 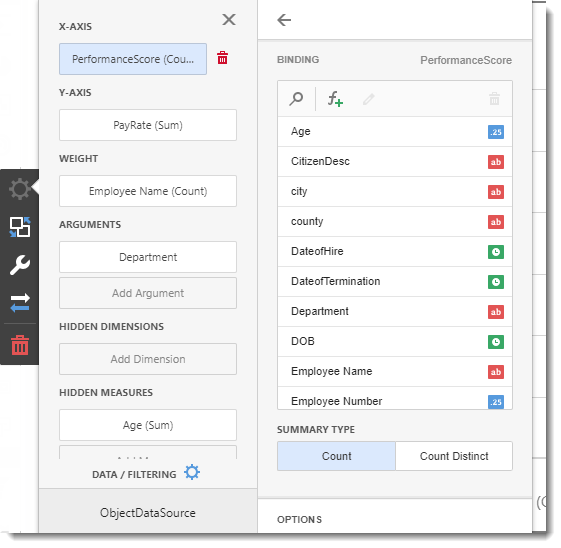 Count: Count all variables in the data. Caption: This is the heading for the X-Axis selected. 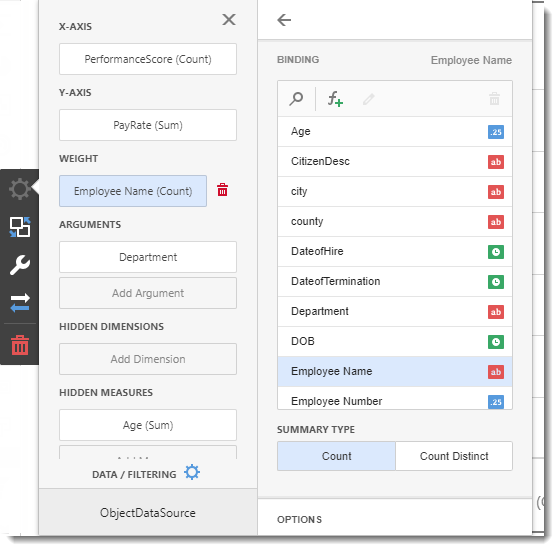 It is best to caption the visual with a variation of the question asked at the beginning of creating the dashboard. 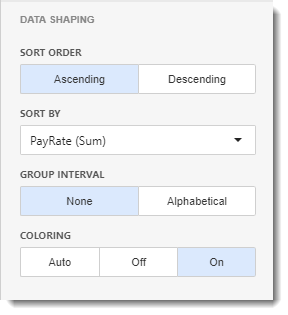 Y-Axis section contains the data item against which the Y-coordinates of data points are calculated. Caption: This is the heading for the Y-Axis selected. 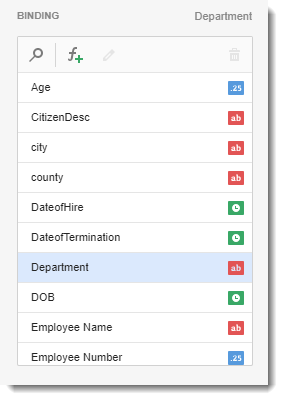 It is best to caption the visual with a variation of the question asked at the beginning of creating the dashboard. 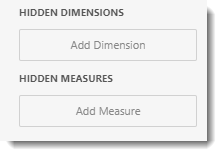 Weight section contains the data item whose values are used to calculate the weight of data points. Caption: This is the heading for the Weight selected. 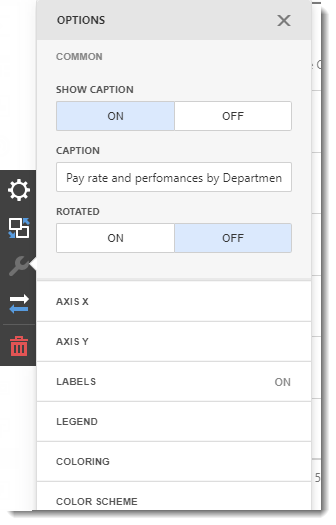 It is best to caption the visual with a variation of the question asked at the beginning of creating the dashboard. 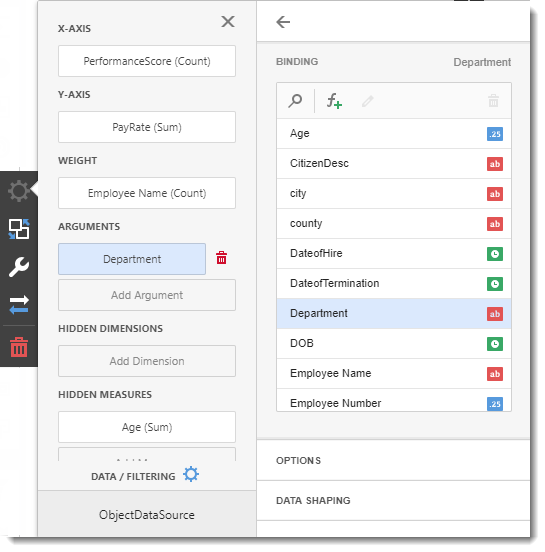 Arguments section contains data items that provide scatter chart arguments used to create data points. 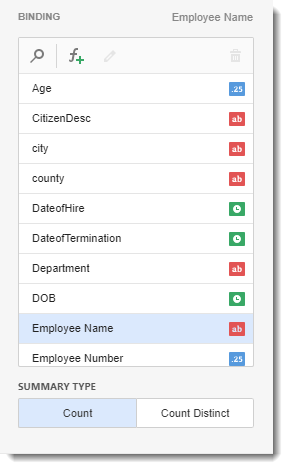 In this example, we want to sort the Department by Employees age. 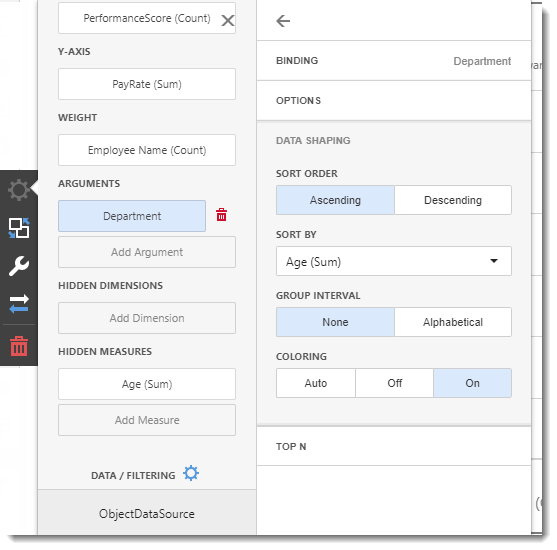 In this case, I want to sort Department by Employee age. 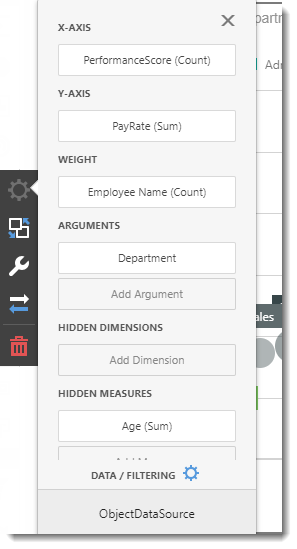 In the Arguments section select Department and click Data Shaping. 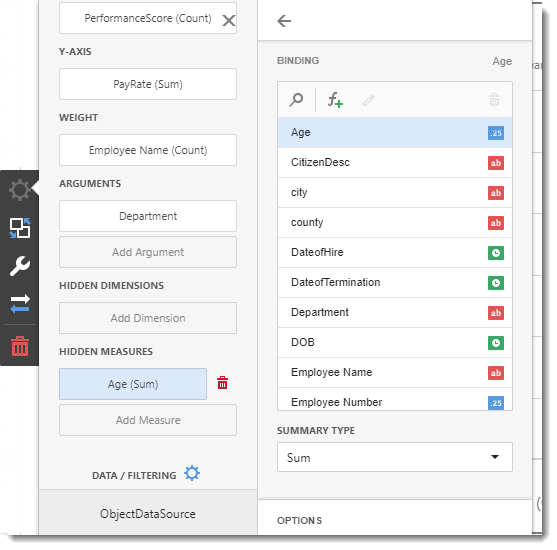 In Data Shaping, go to the Sort By section and select Age. 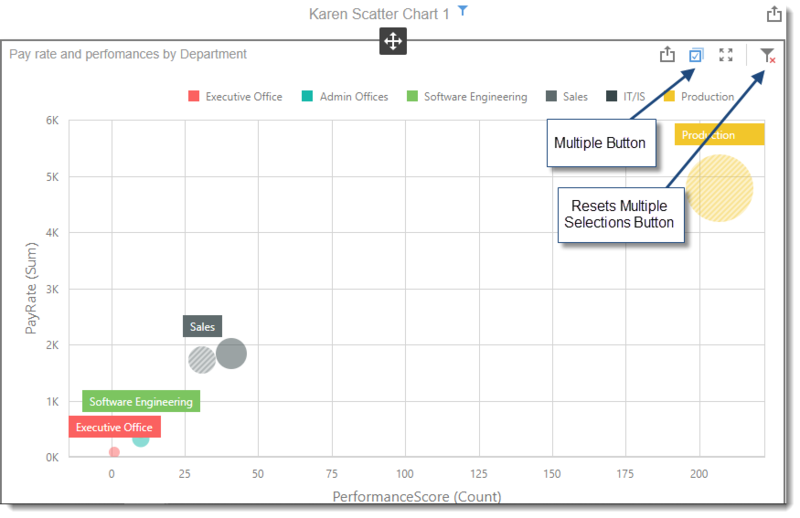 The interactivity features enables interaction between several variable in the Scatter Chart. 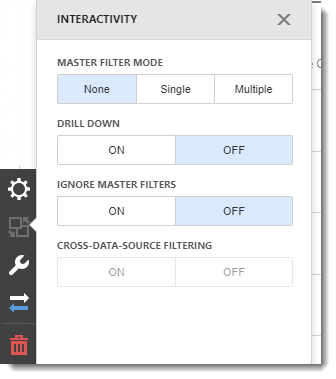 Drill Down in Scatter Chart requires more than one value in the Argument section. Rotated: You can rotate the Axis by clicking ON. 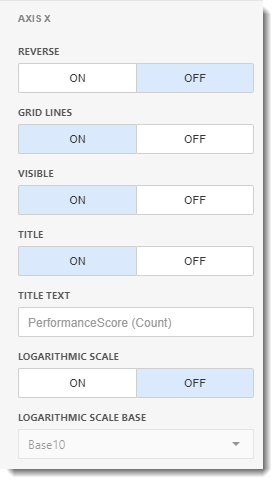 Logarithmic Scale: You have the option to set the X-Axis to logarithmic scale. 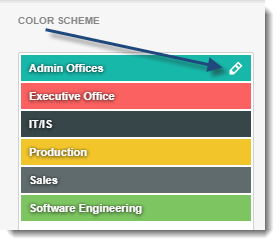 In this section, you can specify which information should be displayed in the point labels. 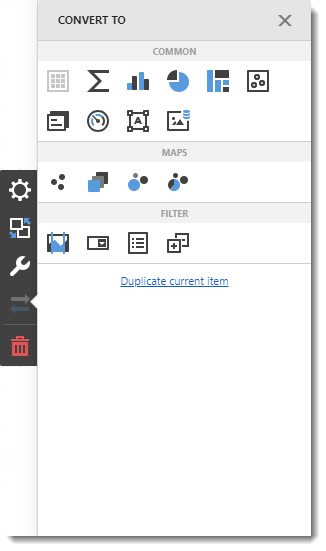 Show Point Labels: You can enable or disable point labels contents. 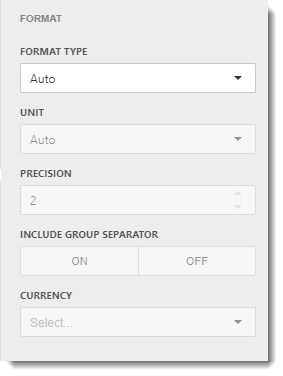 Content: If Show Point Labels is ON, you may select which o type of description you want to show in Point labels. Argument: Point Label will be displayed with the Arguments section data. Weight: Point Label will be displayed with the Weights section data. 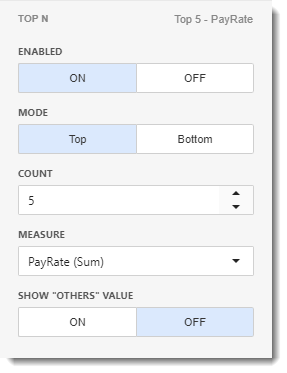 Value: Point Labels will be displayed with the Value section data. 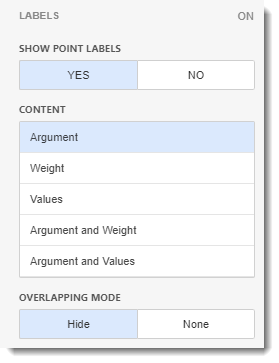 Argument and Weight: Point Labels will be displayed with the argument and weight section value. 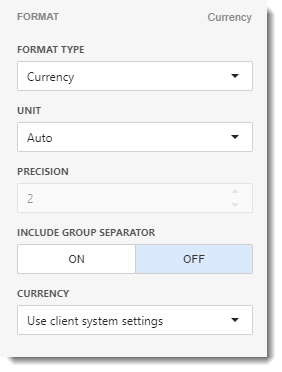 Argument and Value: Point Labels will be displayed with the argument and value section value. 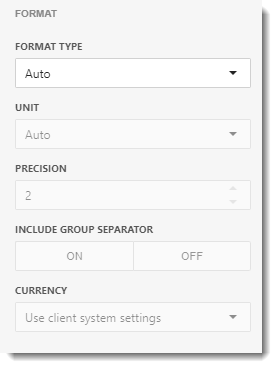 Overlapping Mode: You can enable or disable the overlapping mode. 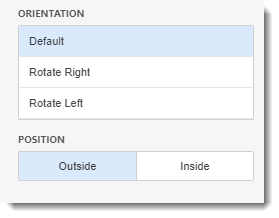 Orientation: You can set up the point labels orientations here. 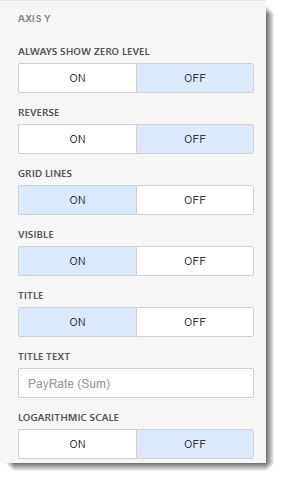 Position: You can set the point labels content inside of the bar or outside. 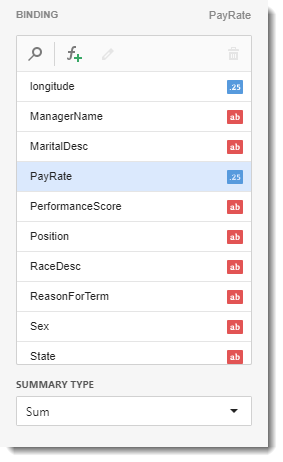 You can change or enable colors to the arguments and values in the Scatter Chart Visual. 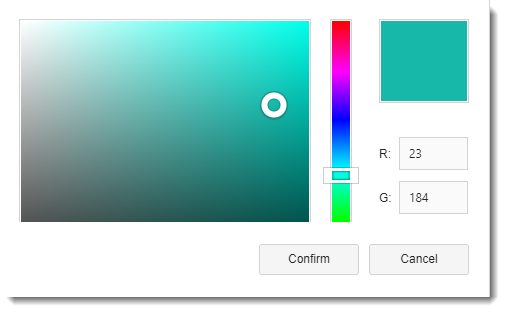 You can change the default palette used to color Scatter chart tiles. 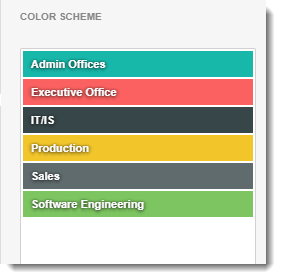 For this, go to Color Scheme section.